Der Artikel H.P. Lovecraft: Dreams In The Witch House - The Complete Philips Recordings wurde in den Warenkorb gelegt. H. P. Lovecraft war eine US-amerikanische Psychedelic-Rock-Band, benannt nach dem US-amerikanischen Autor H. P. Lovecraft, die 1967 in Chicago gegründet wurde. Der Sound von H. P. Lovecraft war typisch für den Acid Rock der späten 60er Jahre. Die 23 Tracks umfassende 'Best Of'-Compilation "Dreams In The Witch House" wird jetzt auf Cherry Red wiederveröffentlicht. Inklusive vier Bonus Tracks und eines umfangreichen Booklets mit Fotos und Interviews der Bandmitglieder. Remastered! 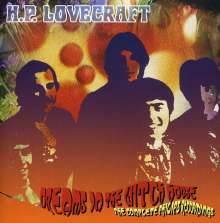 H. P. Lovecraft... the legendary 1960's Chicago underground band fondly remembered for some of the earliest FM hits. As much of a European cult as Captain Beefheart or Love, yet they remain almost a mystery band... few pictures, and few facts... until now! 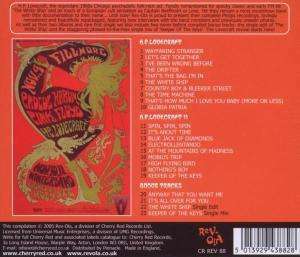 Rev-Ola presents their complete recordings, lovingly remastered, and beautifully packaged...the full unknown story of H. P. Lovecraft - with notes including NEW interviews with the band members by Nick Warburton, band biographer, historian and official webmaster, as well as many previously unseen pictures, including legendary and rare psychedelic posters. This material has never been on CD in Europe before, and that's not all! We also include two Never Compiled Not Even On Vinyl bonuses: the innovative radio edit of 'The White Ship' (the version which made it a huge FM hit!) and the staggering phased-to-the-max single mix of 'Keeper Of The Keys'! The haunting sound of H. P. Lovecraft as you've never heard or seen it... what a start to the year, eh! ?